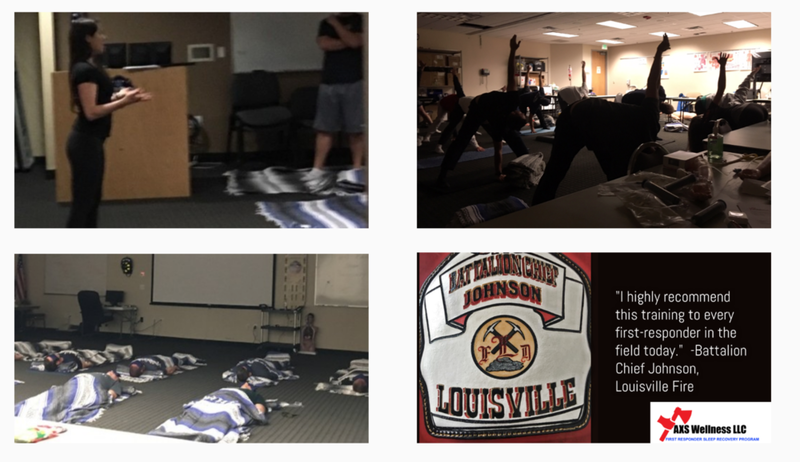 The First Responder Sleep Recovery Program is a sleep deprivation mitigation training tailored for firefighters. this 4 hour training is broken into 2 segments, educational & experiential. it includes research on firefighter sleep related health issues, nutrition, how to improve sleep with transformative sleep routines, sleep recovery practices™ and more. Sleep Recovery practices™ have been proven to directly benefit sleep, treat ptsd, anxiety, depression and support everything from performance, mental wellness, stress reduction, energy and cardiovascular health. this training will be invaluable to restoring your energy, improving your hormones, enhancing your immune system and offer peace of mind with drastically improved sleep. Address the problem of unrecognized and undiagnosed sleep disorders in the fire service. Offer company support of Subject Matter Expert and AXS Wellness Founder, Jacqueline Toomey, in sleep loss solution trainings. Offer a custom tailored sleep wellness regimen to accompany First Responder Sleep Recovery Practices. how sleep loss is intricately linked to the leading causes of firefighter deaths. Educate on the value of the NREM/ REM Sleep cycle while examining the short and long term impact of disrupted sleep. Educate on proven research of the efficacy of the Sleep Recovery Practices, which are based in the yoga nidra methodology. Learn how to establish an optimal sleep routine to enhance sleep quality. These solutions will prevent the life-threatening effects of recurrent sleep loss which will improve ability of first responders to fall asleep, enjoy sound sleep and reclaim healthy sleep patterns.